This installation of photographs from the Museum’s permanent collection was chosen to accompany the Natalie Frank and Lawrence Tarpey exhibitions. Ralph Eugene Meatyard and Duane Michals are each known for creating distinctive narratives using staged photography, often pushing their image-making toward other genres, including film, theater, and literature. A Lexington optician, Meatyard was an avid reader whose fascination with Zen philosophy informed his photographic practice. Rejecting the idea of photography as a mirror of nature, he experimented with multiple exposures and blurred images and employed a wide variety of props, including masks. He often worked in abandoned farmhouses, posing family and friends in mysterious and sometimes troubling tableaux that explore the ephemeral nature of life. Michals is known for his use of sequential images, often with handwritten texts that add another layer of interpretive data to the visual experience. He claims William Blake, Lewis Carroll, and René Magritte as influences on his work, which is not surprising given the altered reality and confessional aspects of his production. 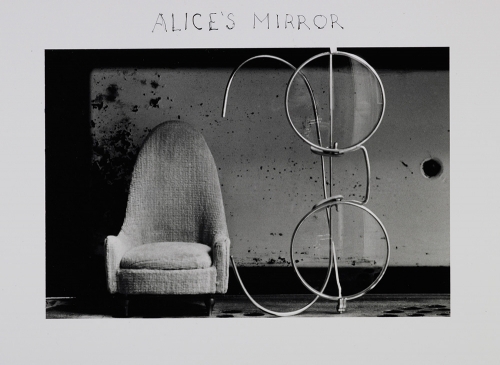 In Alice’s Mirror, he invites us to step through the looking glass, using miniaturized sets to shape our perception.